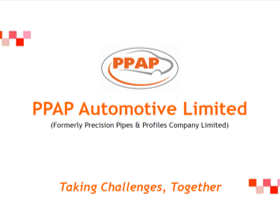 PPAP is led by Mr. Ajay Kumar Jain who is the Chairman and Managing Director. He is also the President of Toyota Kirloskar Suppliers Association. Abhishek Jain is the Executive Committee of Honda Suppliers Association. PPAP have recently added Suzuki Motorcycles which is a leading two wheeler manufacturer as a newcustomer. They would be manufacturing injection molded parts for them. Tata Motors and Toyota India have also outperformed, supported by the launch of their new products InnovaCrysta, Fortuner and Tiago and a low base of reference last year. Hyundai India performed in line with the industry; however Honda Cars India registered a 19% Y-o-Y decline in its monthly domestic sales during December. Mahindra & Mahindra also underperformed reporting an 8% fall in volumes owing to higher exposures in the rural economy. The management of Maruti has indicated that it is expected to grow at least 10% in the current financial year despite the impact of demonetization. For Plastic Sealing System the company is catering to almost 70% of the Indian market and90% market share with each of their customers’ components. The other income is around INR 80 lakhs income which is expected by consistent subsidy and rents, interests and gain on foreign currency fluctuations etc. PPAP is also exploring new opportunities especially in the region of injection molded parts with SMG. PPAP has already supplied parts to Hyundai for evaluations and the parts have been on trial on the vehicle as early as last week and the results are positive. The company is focusing fundamentally on making the operations of the company strong.